was difficult to strike and in the end they were removed. Mint director George N. Eckert saw the need to keep a visible symbol to indicate the change in metal content, so he kept the arrows flanking the date on either side. features Liberty seated upon a rock. Her right hand is resting on a union shield and her left hand is grasping a staff topped with a Liberty cap. The entire design is surrounded by thirteen stars and the date at the bottom. 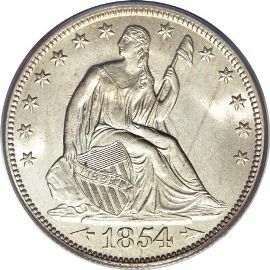 The reverse of the coin is identical to the previous issue in 1853 with the exception of the glory of rays being removed. The back of the coin features an eagle with wings spread, and a shield superimposed on its breast. 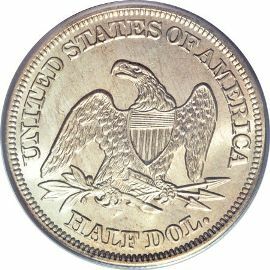 The inscriptions "UNITED STATES OF AMERICA" and "HALF DOL." surround the entire design.